Above: Leaving Greece (1962). I am in the middle; on the left of me is my wife Aggela, while to my right is my sister, Athina (Sarelli). Others are mostly from the Sarelli and Gnisio families. Above Right: With friends, Pandelis Kambas (middle) and Grigoris Kambas (right). They are cousins from Hidera (Lesvos). 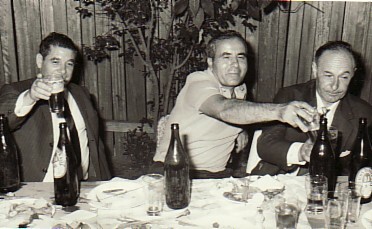 Above: With my cousin, Andreas Iosifellis (left) and friends, Andreas Karapeperis and Kostas Bebedellis (both on the right). Above Right: With my wife, Angela, and our son, Kosta. Above: With work friends. While I was in Sydney, I worked at a factory in Sydneham, which made plastic bags. Above: A recent photograph of me.